On November 1st and 2nd all across the nation people of all ages and backgrounds will gather to remember loved ones in outrageously imaginative celebrations of Dia de los Muertos or Day of the Dead. Once confined to countries South of the Border, the Day of the Dead is trending mainstream in the US and becoming enormously popular. Over the last three years Tlaquepaque Arts & Crafts Village has honed its own special multi-day celebration of Dia de los Muertos, from Tuesday October 28th to Sunday November 2nd and everyone is warmly invited! Admission is free and for those coming Saturday, November 1st, free trolley service will be available from the Uptown municipal parking lot. Come see dramatic, story-telling fire dancers accompanied by the exciting musical ensemble, DiVom, amazing aerial silk artists, jugglers, ghoulish stilt walkers and folks decked out in outlandish Day of the Dead costumes and traditional Muertos painted faces. Heart-pounding flamenco music and dancing, traditional Mexican fare and themed face painting are all part of the weekend celebration Saturday and Sunday November 1st and 2nd. To set the mood for the weekend and to express love and appreciation for those who have passed on be sure to take part in the Marigold Mural Project – the creation of a 26 x 6 foot colorful mural of remembrances, now in its third year and growing in popularity. Murals from the last two years will also be on display. The project kicks off the Day of the Dead events and activities on Tuesday October 28th at 11:00 am in Tlaquepaque’s Calle Independencia. This year’s cultural ritual from Mexico is designed to be engaging and participatory at Tlaquepaque where everyone can join in on this centuries-old observance. Traditionally Dia de los Muertos often starts weeks in advance where families gather creating special shrines in the home, preparing personal offerings or offrenda, and baking Pan de Muerto, special Day of the Dead bread, Sugar skulls, candles, cempasuchil flowers, paper mache skeletons and plates with the favorite foods of relatives who have passed are also part of the observance. It is believed that the spirits consume the essence and the aroma of the foods that are offered. When the spirits depart, the family, friends and neighbors that remain share the food together in celebration. Symbolic offerings of real things and past times that the loved one enjoyed in life are placed on the handmade altar as well. Marigold Mural Project runs from October 28th and concludes Sunday, November 2nd at the close of the Dia de los Muertos celebration. Come to Calle Independencia in the arts village from 11:00 am to 5:00 pm daily. Paint and brushes will be provided as well as guidance from Lovejoy, the gifted artist and muralist painter of the striking garlands and skulls framing the 26-foot mural. “For the last two years the outpouring of emotion and love as people paint their messages of remembrance to those who have passed on has been so moving,” reports Wendy Lippman, Resident Partner and General Manager of Tlaquepaque. “We expect the turnout to be even bigger this year, so be sure to find space on the mural. You don’t need to be artistic. Just come and add something personal to the mural. It’s is a way to create something inspiring, wonderful and lasting as a community,” says Lippman. Saturday and Sunday (November 1st and 2nd) is a time of offering and celebration. The talented event production team, Showstoppers, will once again be transforming Patio Del Norte and, this year, Patio de las Rosas next to the Secret Garden Cafe. The main fountain in patio del Norte will be adorned with autumnal decor of rusts and golds. Beautifully articulated altars in both Patio del Norte and Patio de las Rosas creates an inviting ambience, encouraging everyone to bring offrenda of photos and objects of remembrance of loved ones no longer here. Traditional Day of the Dead cakes, cookies, time-honored fare, and more will all be part of the festivities. Dia de los Muertos costumes and a little attitude are encouraged…and don’t forget your camera! Musical entertainment during Dia de los Muertos Celebration is high-energy and high drama. And it happens both nights! DiVom, lead by pianist and composer David Vincent Mills and his troupe, will beguile with their primal fire dancers. Performing “Carnaval de la Vida,” a fusion of theater, fire and dance, it is totally original and enthralling! Jugglers, stilt walkers, aerial artists with their breathtaking show is all happening along in Calle Independecia from 5:00 pm to 8:00 pm. Ready for more? Sedona’s own Eric Miller, brings his high-flying flamenco guitar feats to Patio del Norte from 4:30 to 7:30 pm. Drew Bennett, Grammy-nominated flamenco guitarist, and Native American flutist will be performing in Patio de las Rosas between the Oak Creek Brewery & Grill and Secret Garden Cafe from 4:30 to 8:00 pm each night. And be sure to check out Gaetano and Friends, a Tlaquepaque Fiesta favorite, delivering exhilarating flamenco guitar music and dance in Patio de las Campanas from 5:00 to 8:00 pm. When you work up an appetite from all the excitement enjoy scrumptious South of the Border fare and beverages from Tlaquepaque’s El Rincon Restaurante Mexicano, in their outdoor booths along Calle Independencia. STAR Seeds will have a tent with delicious nut butters and sinfully special chocolates on hand for your pleasure! Finally, to really get into the spirit of Dia de los Muertos be sure to head to the free face painting area in Calle Independencia to be made-up in the over-the-top designs of Day of the Dead, from 4:00 to 7:00 pm. Day of the Dead arts and crafts will be available as well. And don’t forget to get a jump on holiday shopping by visiting Tlaquepaque’s artful boutique shops and world-class galleries. Home to more than 47 shops and galleries and four restaurants, Tlaquepaque, the Art and Soul of Sedona, now in its 41st year, is located at 336 State Route 179 in Sedona, Arizona. It is open daily at 10:00 am. 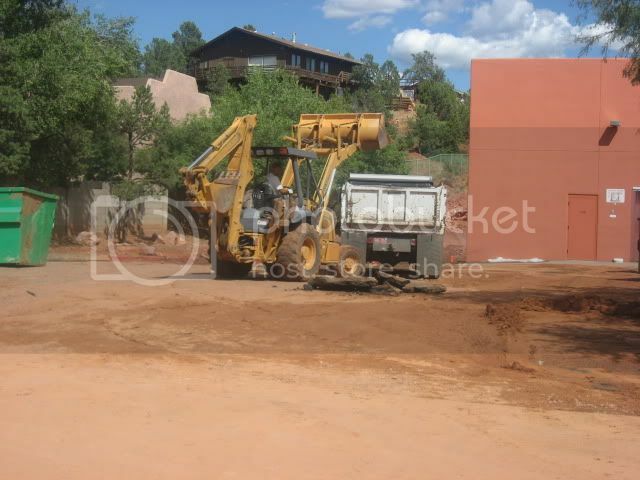 For more information call (928) 282-4838, visit: www.tlaq.com. Join us at Tlaquepaque in Patio del Norte and Patio las Campanas on Saturday, October 29th, 2011 to make an offering at the Celebration of Dia de los Muertos . Ofrenda or Offering, in the traditional Mexican celebration of Día de los Muertos, is created to remember the dead and to honor ancestors. A special spot in the home is customarily selected to put photographs, flowers, decorations, lit candles and the favorite food and drink of those who have passed away. This act of preparing an altar of offerings to the dead helps transform grief into acceptance. In Arizona, the making of portable Ofrendas to be displayed for exhibition has become a form of contemporary cultural expression. Expand your knowledge of Día de los Muertos through the beauty and creativity of Ofrenda installations by joining us and making any personal offering for those special friends, family members or even special pets that might be missed. This year we will be featuring the music of Maestro Drew Diego Bennett in Patio Del Las Campanas and also Eric Miller in Patio Del Norte! Both musicians will be performing from 4:30 pm to 7:30 pm on Saturday, October 29th! Renowned watchmaker Geoffrey Roth will be presenting hishandmade timepieces with an original model on display for the first time. Wine reception Friday, May 13th 5 P.M. to 8 P.M. and all day Saturday, May 14th 10 am to 5 pm. Geoffrey’s life long love for precision machinery andengineering has propelled him to master the art of fine watch making.His ability to fuse tradition, artistry, precision engineering andinnovative design has resulted in his version of a wrist watch.Geoffrey considers luxury watches to be “the epitome of personalmechanical instruments”. Designed, machined, assembled, andtested in his studio in Sedona, Arizona, these fine timepieces areavailable in only very limited editions. Tlaquepaque Celebrates Fourth of July in Sedona! This weekend, Tlaquepaque will host a sizzlin’ summer bash to celebrate and honor Independence Day. The event will feature music from a Dixie Land band, the Geritol Hipsters, and a bit of jazz and country from the Cat Black Band. The music will surely have you dancing on your feet all afternoon. For the kids, there will be face painting, potato sack racing and a pie eating contest for kids of all ages… So join the fun – relax, feast and shop at Tlaquepaque! The festivities take place on Saturday, July 3, at the beautiful Tlaquepaque Arts and Crafts Village in Sedona, from 10 a.m. to 5 p.m. Call 928.282.4838 or click here for further information. Yesterday, the bronze elk (by local artist Chris Navarro) pictured above was laying on it’s side with a car on top as you might recall. Today, he has been restored to his full splendor – believe it or not, the elk won out over the car. The car sustained significant damage and the elk shows the sturdiness of bronze – he is completely unharmed! The owners of the Secret Garden Cafe told us that nearly 2 feet of water stood inside the restaurant where they and customers were also trapped for hours. They watched as the car came slamming into the courtyard outside their front doors and took out the 10 ft bronze elk, landing on top. Owner, Candace Peterson showed me her screensaver on her cell phone – an all-too-close-up photo of the car “parked” precariously infront of her business. Thanks to volunteers, the inside of the restaurant is already cleared out although the beautiful “garden” is still filled with mud at the moment. They plan to re-open Monday morning after they’ve had time to finish cleaning up. Over 40 volunteers showed up this morning at Tlaquepaque to begin major clean-up efforts. Emergency Management Teams were on hand, plumbers, cable crews, gas crews, etc. all worked together to repair the damage from the flood in order to get Tlaquepaque up and running in time for Fiesta del Tlaquepaque on Saturday. Within hours, the difference was clear. In many areas of Tlaquepaque, you can’t even tell there was a flood yesterday. 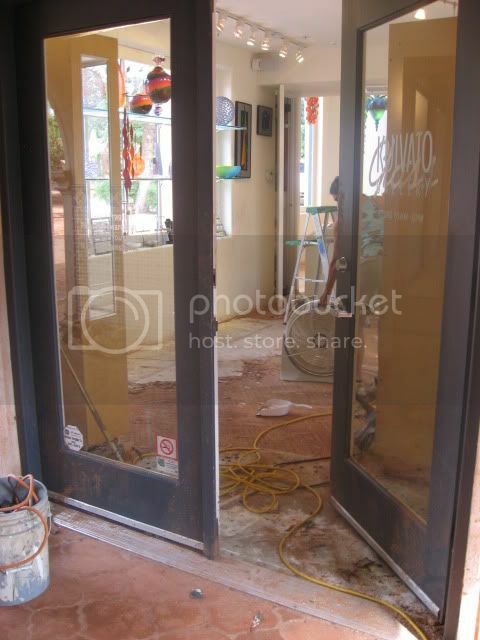 Proof of how “many hand make light work.” I’m told this business took the brunt of the flooding yesterday with up to 8″ of standing water inside that receded into a foot deep of mud they had to clear out this morning. I was stunned when I peeked inside and could not see any remnants of the flood. Thanks to all the volunteers and hard-working business owners at Tlaquepaque! Onlookers stood trapped on the balcony of the Oak Creek Brewery yesterday watching helplessly as many people stranded in their vehicles waited for rescue. 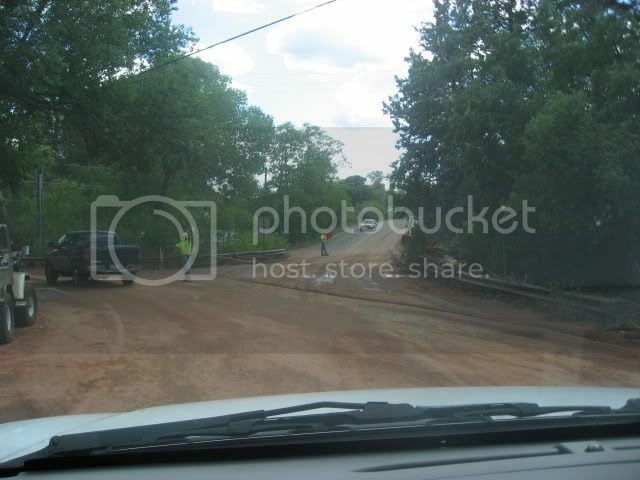 Today, Portal Lane (below) is open again, it’s just a “dirt” road today as they continue to clear the mud and debris. 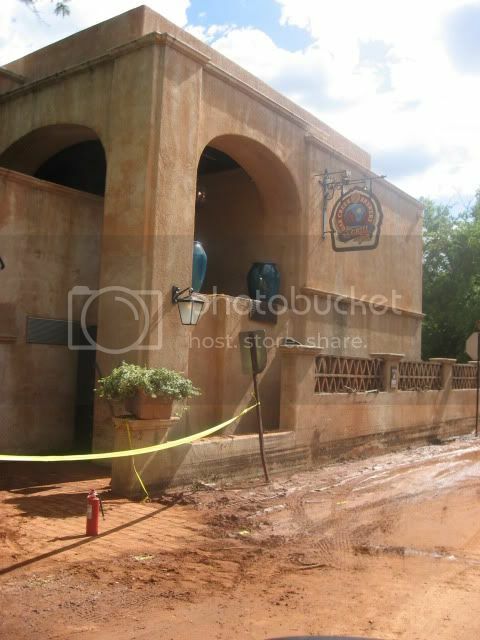 About 80% of the businesses at Tlaquepaque received flooding damage. Some reported up to 8″ of standing water in their businesses as a wall of water came rushing through. Adrienne Harris, Owner of Cucina Sedona and Verdigris Gallery at Tlaquepaque told us that yesterday was a VERY bad day for her, “My home was flooded, two of my businesses were flooded and my car was totalled.” Thankfully, her third business, the Wild West Wine Co., an upstairs business at Tlaquepaque was unaffected and both of her businesses plan to re-open on Tuesday. Her sister, Leslie’s business, Diva Sedona, located across from Rene’s was also hard hit. Today, many tenants were ripping out carpet and sucking water and mud out of their beautiful businesses. Already today Renee Taylor Gallery, El Rincon Ristorante, Eclectic Image Gallery, Nectar, Feliz Navidad, Inner Eye Gallery and many others who were directly affected were open for business again. The remaining businesses like Secret Garden Cafe, the Oak Creek Brewery, and Rene’s plan to re-open tomorrow or by early next week at the latest. Fiesta del Tlaquepaque is also scheduled to go off without a hitch tomorrow from 10 am to 5 pm with performances throughout Tlaquepaque, artist exhibitions, musical performances and much more. 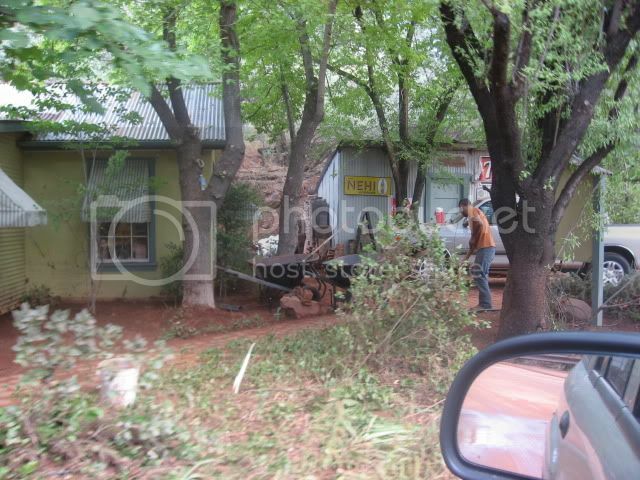 The Hummingbird House on the corner of Brewer Road and Ranger Road sustained the most damage of any business in Sedona. Victims of the flood tell us that a vehicle was washed into the bridge at this intersection creating a damn. When it could no longer hold the pressure of the back-up, it burst through and the “wall of water” many described came barreling through the Tlaquepaque parking lot down a gulley that passes through Portal Lane and normally behind Tlaquepaque. This deluge picked up vehicles parked there and started tossing them around like beachballs. Had it not been for that first car getting stuck in the gulley, the extent of the flooding would not have been so devastating. 2 women were trapped inside the Hummingbird House where 3 feet of water stood outside, rising. The Fire Department had to break through the glass windows to rescue the women inside. Today, the owners and other volunteers sift through the wreckage of their beautiful antique store. 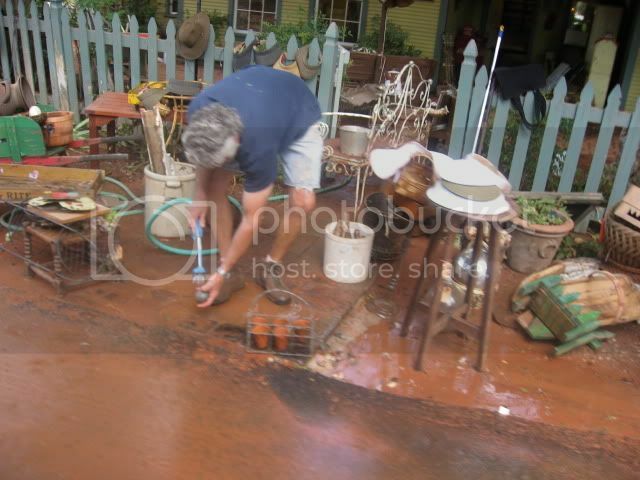 Flooding occured in other parts of Sedona as well including Coffee Pot Dr. where a mudslide was said to have “thrown vehicles” into a local flooring business. Onlookers said it appeared as though the river of mud and water and literally uprooted the roadway and today, many large chunks of road were being cleared around the area although Coffee Pot Drive itself was completely unscatched. 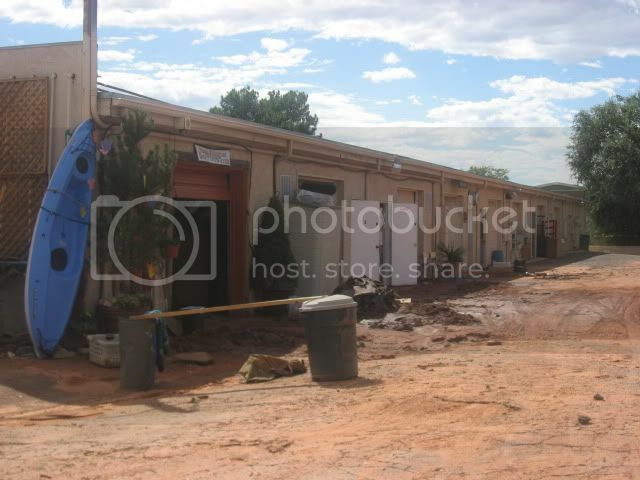 Sedona Adventure Tours appeared to have sustained significant flooding damage from the mudslide/flood on Coffee Pot Road. 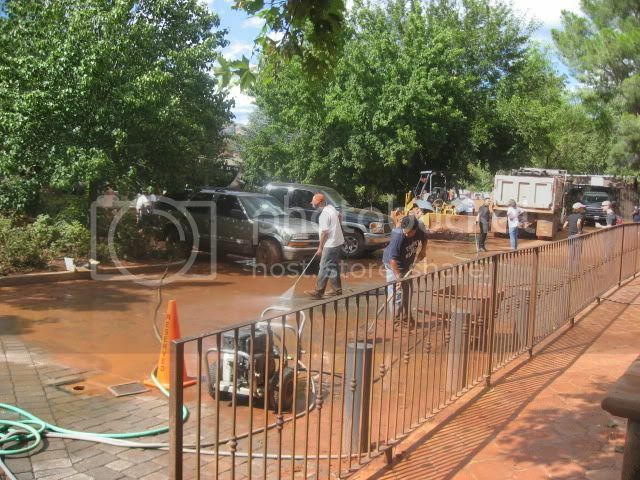 Thanks to the efforts of many hard working volunteers, business owners, clean-up crews, service crews, emergency management teams and citizens, Sedona is getting quite a clean-up makeover today. Businesses plan to be open for a busy September weekend, roadways are clear for travel and if you head to Tlaquepaque this weekend you’re in for a real treat at Fiesta del Tlaquepaque. Please support Sedona businesses by visiting us this weekend. The leaves are just starting to turn in Oak Creek Canyon so come take a drive, take a hike, do some shopping and dining and enjoy the beauty of Sedona. Mother Nature may have had her way with us yesterday, but she also provides us with one of the most spectacular settings in the Southwest to enjoy every single day. 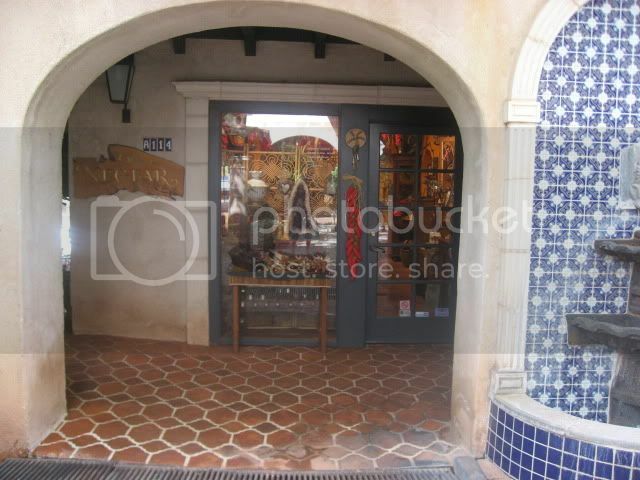 For videos of Tlaquepaque businesses you can plan to visit this weekend, go to our www.Sedona.tv homepage and start exploring the Shops & Plazas category! Hi, I’m Megan, your Sedona Concierge. Got a burning question about What to See & Do in Sedona? 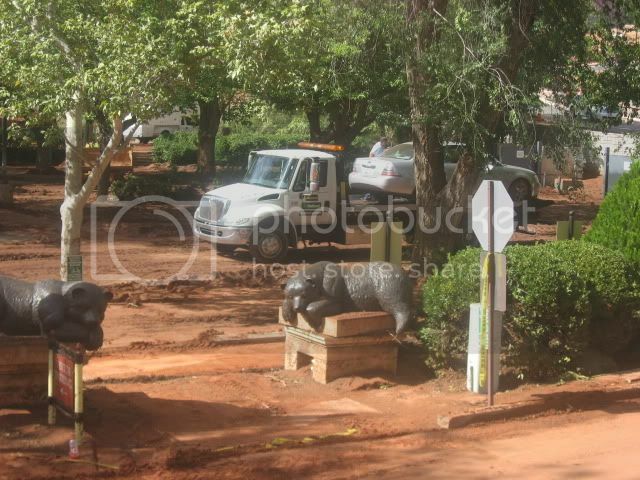 Looking for the best Sedona hotels & motels, restaurants, galleries, shops, spas and more? Post a question! The best ones will be replied to right here on our Sedona.tv Blog with videos and customized recommendations to help you make the most out of your time in the Red Rocks! Great choices so far Rubee! If you want a casual, super yummy breakfast or lunch try Secret Garden Cafe at Tlaquepaque…location is beautiful, food is healthy and delicious. If you want something more formal, I recommend breakfast at L’Auberge over lunch. Cucina Rustica is an excellent restaurant for dinner – try the Grilled Artichoke appetizer – I’ve never had anything like it in my life! I also like Cowboy Club’s Silver Saddle Room or Redstone Cabin for dinner – you’ll get to try some unique items if you like plus the service is impeccable and the food is unbelievable. TRY THE CACTUS FRIES just so you can say you did! LOL! Make sure you do the drive up/down Oak Creek Canyon. Oak Creek Canyon was named one of the top 10 most scenic drives in America by Rand McNally. Jerome is very cool, too! You can never go wrong with a visit to the Asylum – it kind of sits off the side of a cliff overlooking the Verde Valley. I also recommend the Haunted Hamburger for lunch. I’ve never tried it myself but all the locals rave about it. Broken Arrow Tour with Pink Jeep Tours is one of the best jeep tours in town. You will love it! If you can book it for sunset time, you’ll find it even more breathtaking. Also visit http://www.pinkjeep.com/ and sign up for their E-Newsletter to get discounts! Last but not least, just for fun, you might consider trying a pyschic reading – its a true Sedona experience! I’ve had some really amazing readings at the Center for the New Age. Hope you enjoy your trip here! Please come back and comment on how you liked all of my recommendations! Hi, I’m Megan Aronson, your Sedona Concierge. I am the expert on all things Sedona! From current events to restaurant recommendations, hotels and B&Bs to hiking trails and golf courses…and EVERYTHING in between! You can find videos on Sedona Lodging, Shops, Galleries, Restaurants, Spas, Retreats, Spirituality and much more right here on Sedona.tv but if you’ve got a burning question about how you can make the most out of your time in the red rocks, just ask! I’ll pick the best questions and respond right here on our Sedona.tv Blog, making several recommendations for you. I’ll also include informative videos so you can see for yourself which shops, restaurants, galleries, spas, and lodging choices will make YOUR trip to Sedona the most memorable. You might start off by watching the video below – it’ll give you a great overview of Sedona to help you plan your trip here. I know when I travel, I always want to know where the locals go because those are usually the best places to visit – the places that create lasting memories that you will talk about for years to come. So consider me your local insider! Want to know where you can have the best massage of your life? Looking for a less-traveled, still spectacular path for a romantic hike in the red rocks? 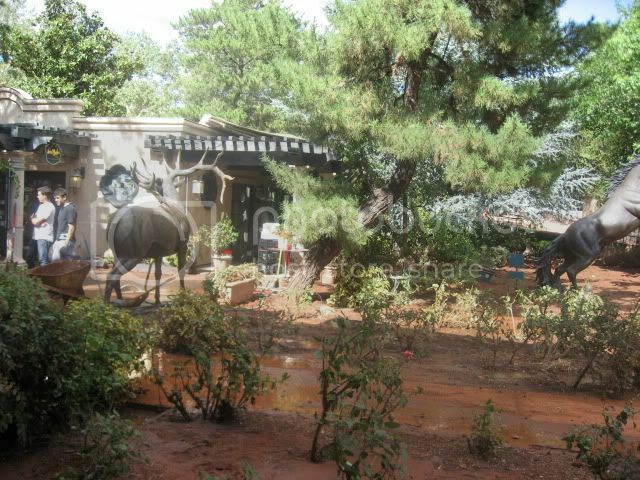 Wondering where you can have an authentic Sedona pyschic reading or healing session? Trying to find a restaurant unlike any other you’ve ever been to? I’ve got answers to all your questions! I’m also a Mom, a dog-owner and an “eco-tourist” so if you want pet-friendly, kid-friendly or GREEN recommendations, I’ve got those too! I’m the host of “Out & About with Megan” on Red Rock TV Channel 16 here in beautiful Sedona and before that I was a Concierge for several years at one of Sedona’s top resorts. I’ve lived in Sedona for almost 9 years and my family has been here for over 40 years. In fact, my parents met here in Sedona in my grandmother’s 8th grade choir class (and they are still married!). I’ve been visiting Sedona all my life and in the year 2000, I moved to Sedona “temporarily,” got the infamous “Red Rock Fever” and never left. Now I couldn’t imagine living anywhere else in the world. The incredible energy of this magical place has changed me forever and continues to speak to me day after day. 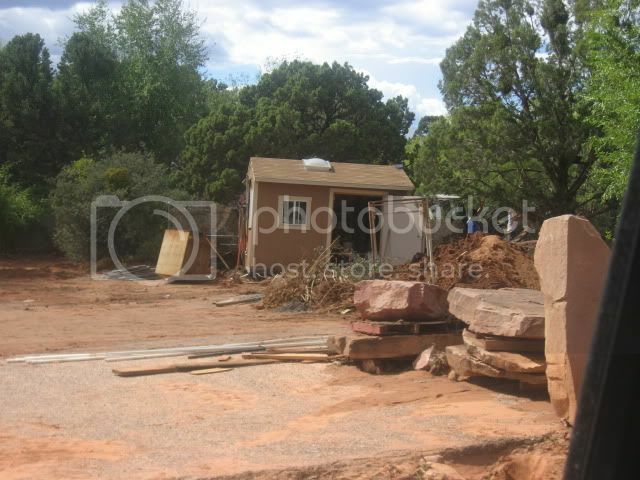 I feel so blessed to call Sedona home and now I am excited to share my home with you! I’ve responded to several questions on Twitter already but its so hard to tell followers about all the great things to see & do here in just 140 characters so from now on, I’m going to pick some questions to respond to here on our Sedona.tv Blog so I can give a more detailed response complete with videos! If you’ve got a question, please post it in the COMMENTS area! You can also visit our FAQs page for a list of frequently asked questions on Sedona’s weather, the Red Rock Pass, how to pronounce that strange word Tlaquepaque (and what exactly is it?! ), why the rocks are red, what is a Vortex and much more. Take a little time to watch the video below and I guarantee you’ll be packing your bags heading to Sedona soon as you can! P.S. You don’t have to be traveling to Sedona to have a burning question about our Red Rock Country – feel free to post questions whether or not you’re comin’ for a visit! See you in the red rocks – I promise, you’re going to have the TIME OF YOUR LIFE!!! It happens every year. February blows by like a crisp winter wind, March 1st arrives and its as if overnight Sedona and the Verde Valley come to life in anticipation of Spring. Suddenly, a plethora of events come flooding out into the sunshine along with thousands of people coming from near and far to enjoy them. We’ve compiled a list of upcoming events, new and old, to whet your pallette for Springtime, inspirational art, and the melodies of Sedona’s diverse arts and culture scene. So come out of hibernation – the weather is IDEAL! We’ve got unbelievable 60 and 70 degree weather with limitless blue skies and sunshine, red rocks and fun – and we’ve got something for everyone! Friday, March 6th 5-8 p.m.
Every month Sedona’s finest galleries roll out the red carpet, local wines, appeteasers and featured artists for the First Friday Evening in the Galleries Event. This month nearly every gallery on the tour has a special exhibit or artist reception where you’re likely to meet the artists behind the artwork. The best way to tour the SGA Galleries is to hop on the Sedona Trolley – they’ll take you from gallery to gallery so you can skip the driving and safely enjoy a few sips of the local vinos offered. View El Prado’s Video Web Page on Sedona.tv here. View James Ratliff Gallery’s Video Web Page on Sedona.tv here. Mountain Trails Gallery will be highlighting the works of Western Bronze Artist Dustin Payne. View Sedona Arts Center’s Video Web Page on Sedona.tv here. This popular exhibition will feature juried works in all sizes, mediums, and price ranges showing works of emerging and professional artists. Prizes to be Awarded! Preceding the Juried Members Exhibition the Poets Corner 2009 Season Opener will take place from 4:00 – 5:00 pm in the Sculpture Garden at the Sedona Arts Center. Hosted by NORAZ Founder Christopher Lane watch out for poet Chris Linfors, Sedona Red Rock High School’s David Black, and poets from Sinagua High School Flagstaff. PLUS performance poets from Phoenix, Tucson and Flagstaff will be entertaining the crowd. This is going to be a fun one! For more information on the Sedona Gallery Association & the First Friday Evening in the Galleries visit http://www.sedonagalleryassociation.com/. Saturday, March 7th 5-8 p.m.
Meander through the streets of Jerome’s historic shopping & art district to visit over 20 galleries on the 1st Saturday Art Walk. This monthly event takes place on the first Saturday of every month & this month several of the galleries are offering artist receptions, exhibitions, live music, drinks and hors deourves. View Geoffrey Roth’s Video Web Page on Sedona.tv here. Located in Los Abrigados Resort & Spa at 160 Portal Lane adjacent to Tlaquepaque. Learn more about Stakes & Sticks on their video web page on Sedona.tv here. Fore more information on the events and businesses featured here, come explore the first-ever online video portal to Sedona & Northern Arizona http://www.sedona.tv/ . This ground-breaking new website features over 100 exciting and informative videos on everything to see & do in Sedona from Sedona lodging and restaurants to galleries, tours & activities.